JustMensRings.com (JMR) is a popular online jeweler devoted to selling men’s rings and men’s jewelry. Ever since the company launched nearly seven years ago, the owners devoted most of their time to building an incomparable inventory of men’s wedding bands and fashion rings, but customers started asking for something more. 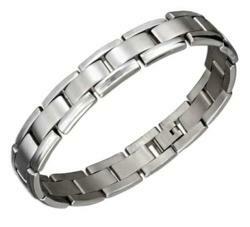 Today JMR is pleased to announce that men’s bracelets are now available at their online store. After spending so much time catering to the underserved market of men’s jewelry shoppers, the addition of men’s jewelry bracelets was the natural next step for JMR. Now, this online jeweler offers an attractive selection of men’s bracelets made from stainless steel, titanium, tungsten carbide and leather. The men’s bracelets now on sale at JustMensRings.com are made in various metals, including stainless steel, titanium and tungsten, plus braided black leather. In addition to their world-class selection of wedding bands, both in precious metals and contemporary metals, JMR has begun to offer men’s jewelry bracelets in complementary styles. 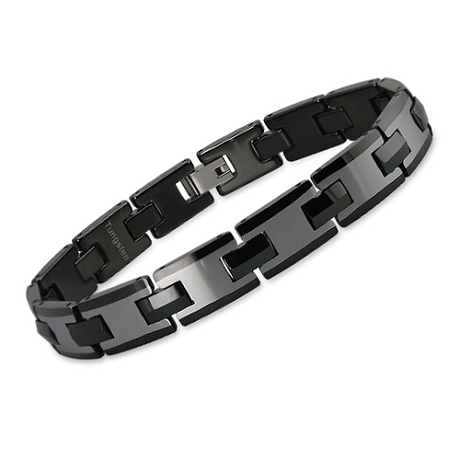 A few good examples from their new collection of men’s bracelets include a two-tone stainless steel bracelet with black and silver links, and a black titanium bracelet with stainless steel connectors. Many of the best looking men’s bracelets on sale today are made with a combination of black and white metals, but they also incorporate non-metal materials like carbon fiber, rubber and leather. Asked about what made JustMensRings.com start expanding beyond rings, co-owner Roy Devine says, “We listen to our customers and we try to take their suggestions seriously. 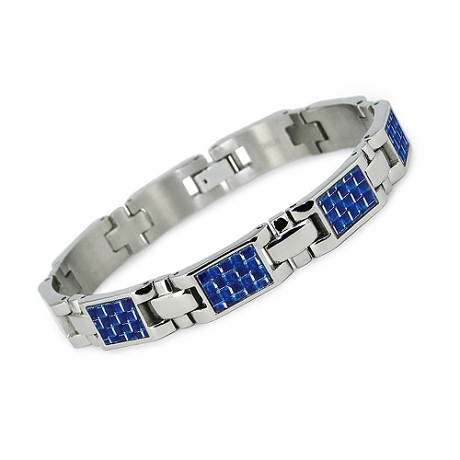 With so many men searching for jewelry online, we knew that there would be a lot of interest if we added men’s bracelets to the mix.” As men begin to feel more comfortable wearing different types of jewelry, the Internet is the first place they go for the latest fashions. Men’s bracelets were the natural “next step” for JMR because they are available in many of the same materials as men’s rings. Excellent customer service, an incredible selection, and unbeatable prices have helped JMR carve out a niche within the men’s jewelry industry, and their new collection of men’s bracelets is just another example of this. In addition to offering rings to match every man’s style, JMR is now giving men another reason to wear jewelry. Looking at the men’s bracelets for sale at JMR, each one has its own individual “look,” ranging from a slim titanium link design to a hardware-inspired bracelet made from stainless steel and rubber. Even bikers appreciate the opportunity to buy a stainless steel skull link bracelet to coordinate with their skull biker ring. In keeping with JMR’s promise of “everyday low prices,” these unique men’s bracelets are affordably priced, ranging from approximately $30 to $90 each. After nearly seven years in business, JustMensRings.com has grown its customer base beyond the United States to include several countries around the world. Their loyal and satisfied customer base has continually grown over the past few years because men have an easy time finding what they want at this retailer. Not only do they update their selection on a regular basis, JMR offers more competitive prices and greater size availability than any other men’s jewelry web site. Now, in addition to having the best selection of men’s rings, they have rolled out a spectacular selection of men’s bracelets.